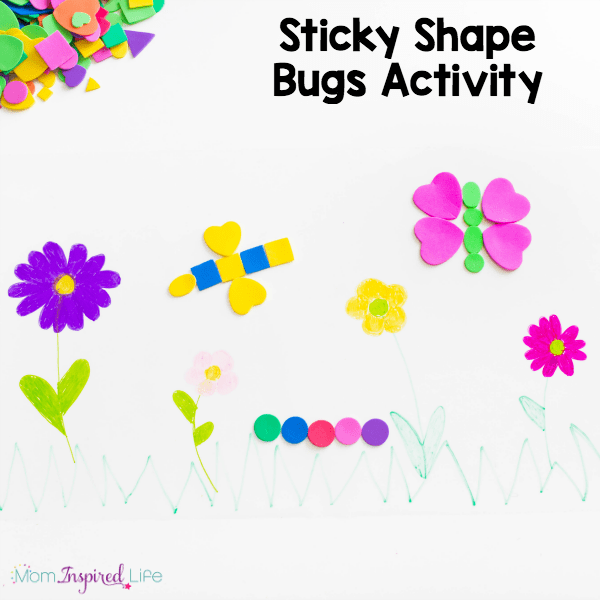 My kids had a blast making shape bugs on sticky spring scene! 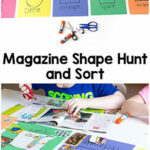 It was a great way to develop fine motor skills and critical thinking skills while learning about shapes. 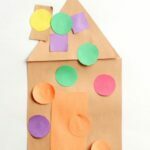 My kids really enjoy doing activities on contact paper. 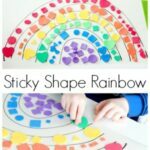 They loved these sticky shape rainbows we made, so I wanted to come up with another version for spring. 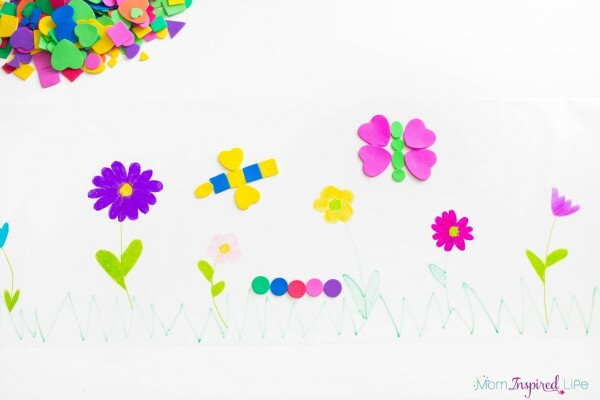 This one includes bugs and spring flowers. I just love it! Roll the contact paper out to the length you would like it to be and cut it off. 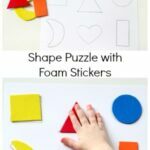 Do NOT remove the backing paper. 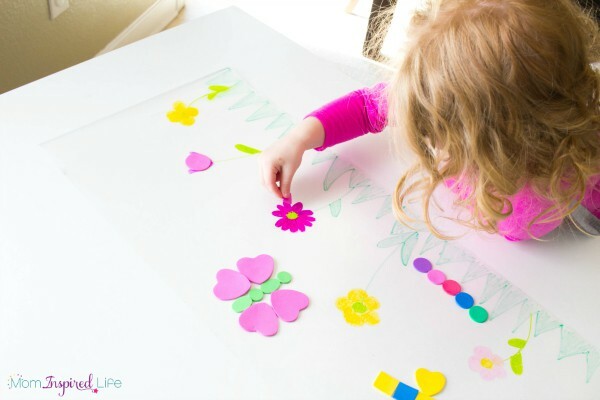 Draw a spring scene on the clear side (not the backing side) with permanent marker. I drew grass at the bottom and then flowers growing up from the grass. I just sat down with them and started making things and they quickly joined in and did things their way. I soon moved out of the way and let them create independently while I watched. That was the best part of this. They didn’t just look at what I did and copy it, but took a totally different take on things. 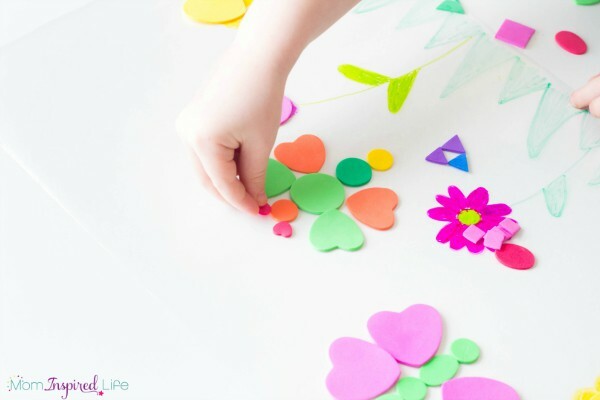 My toddler basically just colored matched shapes to flowers and then stuck shapes everywhere. Hehe. 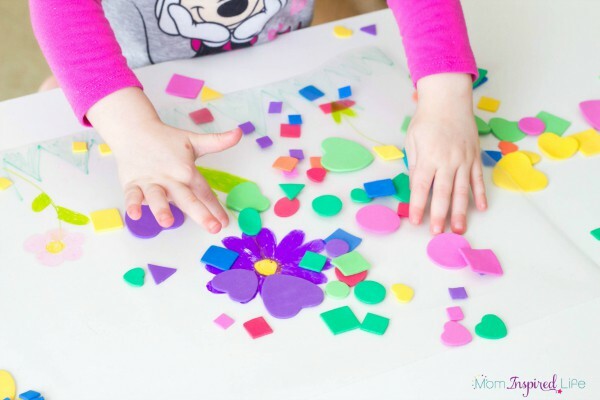 She had an amazing time exploring shapes and colors though! So much so that she didn’t ever want me to put the spring scene away and it sat on our table for days. 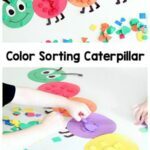 My son made a butterfly, but then realized it would be “way cooler” to make worms, ants, caterpillars and eventually a very long snake. He ended up getting lots of counting practice too. This is because he kept adding circles to his snake and then counting how many circles long he was. He did this over and over again. He also laughed about how puny my caterpillar was compared to his snake. We all had a great time talking and laughing together! 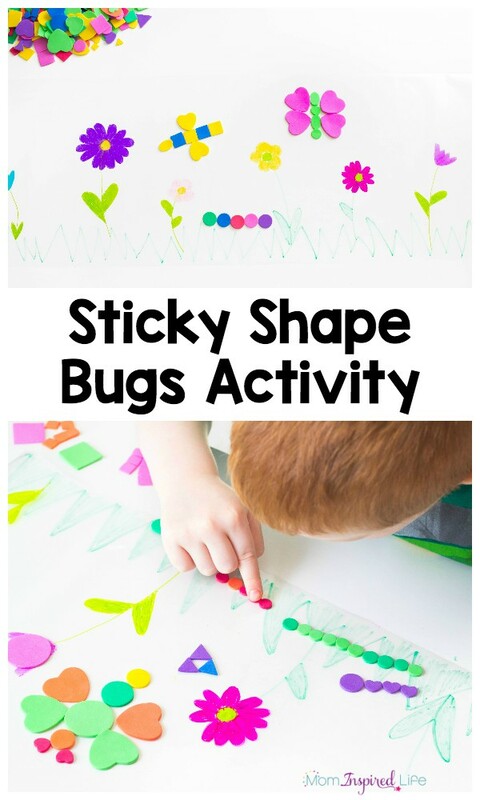 I really like that you can leave it on the table or up on a wall for kids to come back to for days, if you would like. Now I am thinking of other versions we can do. 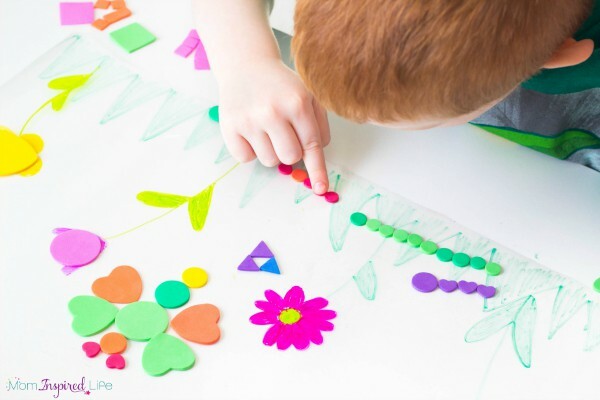 Here are some more spring activities for toddlers and preschoolers.